This petroglyph site sits along Highway 141 at mile marker 99 in the Paradox Valley about 12 miles south of the town of Gateway, Colorado. The Paradox Valley gets its name from the fact that the Dolores River runs across it rather than through the length of it. An underlying salt dome dissolved, causing the land to collapse, and form the valley allowing the Dolores River to cut a course into the valley from a side canyon and back out through another at the present day site of the town of Gateway. The road shoulder at mile marker 99 is just barely wide enough to pull completely off the pavement. 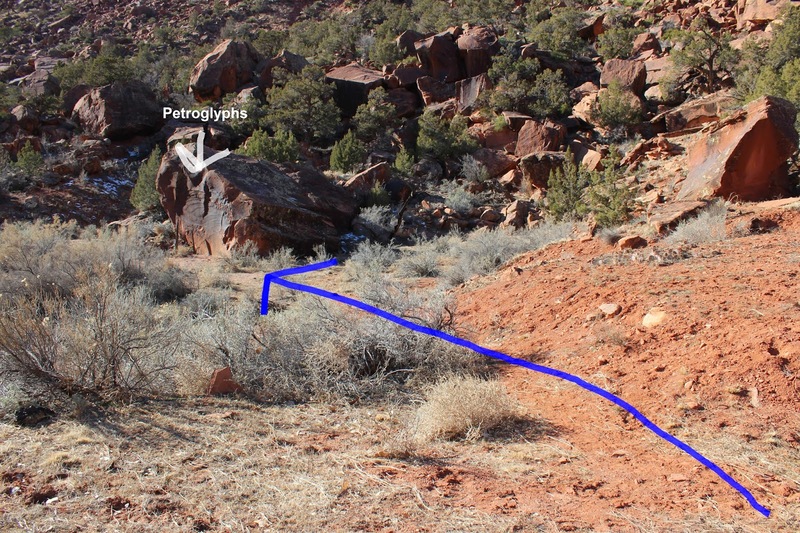 After carefully crossing the highway a faint trail leads over to the boulder with the petroglyphs. The petroglyphs look archaic to us. There is one small figure that looks like a trapezoidal Fremont style petroglyph. The bear paws might be symbols for the Bear Clan. Petroglyphs near the base of the boulder give the impression that more of the rock was once exposed. As old as these images look there could be several feet of fill around the boulder. It would be illegal to do any digging or to disturb the site in any way. Perhaps one day it can be properly excavated and we can all learn more about it. The remains of a rock shelter are along the south side of the boulder. We climbed around in the rocks above the road mostly to play around. The Paradox Valley makes for some spectacular scenery. 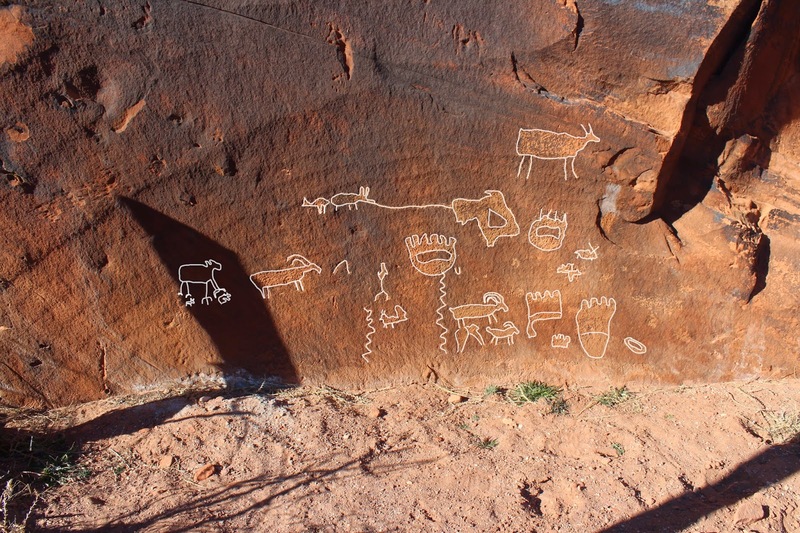 There are a few other petroglyphs here and there in the area that we have come across. These are easy to get to and seemed more significant to us. Please be respectful of the site and tread lightly. If you would like to see it for yourself then all you have to do is 'Take a hike'.